I am thankful for the people who grow our food. Thanksgiving meals offer splendid opportunities to thank local growers by buying what they have grown, and paying what they ask. In the case of turkey, the centerpiece for most Thanksgiving meals, investing in a superb, locally raised bird will make more difference in the flavors, nutrients and sheer goodness of your meal than any other shopping choice you make. And you are investing in central Kentucky when you buy that bird. Yes, locally grown turkeys cost more, or seem to, since many of the environmental and fuel costs of factory-farmed turkeys are not factored into supermarket price tags. 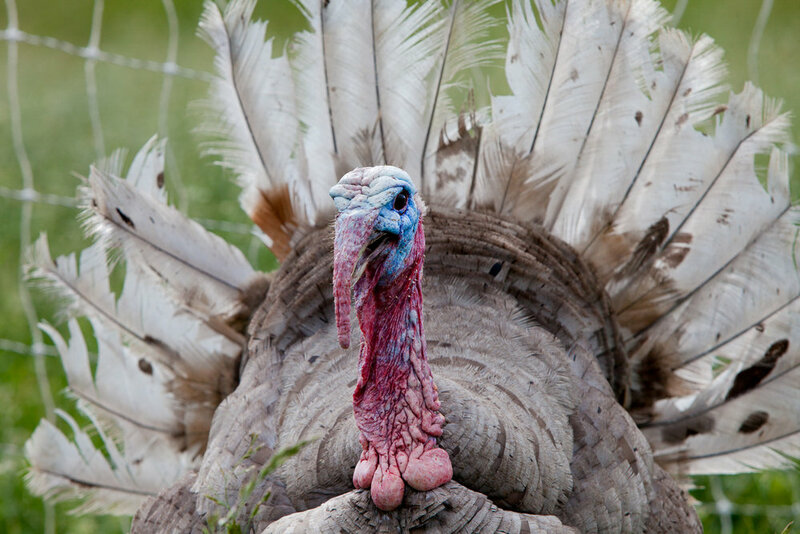 While it is true that not everyone can afford to buy a heritage turkey or an organically raised one, or one grown on pasture, it is also true that many of us who can afford that investment choose a poorly raised, inferior quality bird instead. When we do that, we support factory farming. We short-change our neighbors who farm, and we end up with inferior food for the most celebratory meal of the year. Elmwood Stock Farm turkeys. Photo credit: Sarah Jane Sanders. Thank you! Cook's Illustrated compared Elmwood Stock Farm's dark meat to "pulled pork... so fall-apart tender that it's almost shredding itself," adding in its 2014 review that the white meat "is so rich in flavor it tastes like dark meat." Elmwood farmers grew both heritage breeds and standard American broad-breasted turkeys this year, all on pasture, all using certified organic practices, all requiring an astonishing amount of tender, constant care by dedicated Elmwood farmers. Although some sizes and types have sold out, Elmwood still has turkeys and cut-up turkey pieces for sale for Thanksgiving and Christmas, You can buy and pick up Elmwood turkeys throughout central Kentucky, Louisville and Cincinnati, or have one shipped to you. See all the details here. Buying your turkey from Elmwood or another local producer is a way to invest in our farms and farmers. These investments keep central Kentucky agricultural, helping our region live up to its potential for world-class food production. If a local bird is not a good step for you right now, enjoy other Kentucky bounty -- how about locally grown butternut squash or sweet potatoes? How about local greens from growers at the Lexington Farmers Market (which stays open on Saturdays throughout the winter, by the way). How about Reed Valley Orchard's apples and pears in pies, sauces, and salads? Listen as Elmwood's Mac Stone talks about raising turkeys on the pre-Thanksgiving edition of Hot Water Cornbread: Kentucky Food Radio. Elmwood Stock Farm turkey. Photo credit: Sarah Jane Sanders. Thank you! Sponsors included in this post: Elmwood Stock Farm. Thank you! Readers, if you like Savoring Kentucky, do business with our sponsors, all of whom support the earth, community and an equitable local food economy in extraordinary ways.